BSkyB to share F1 TV rights with BBC, posts £1bn pre-tax profits | What Hi-Fi? News Corporation may have had to withdraw its bid for BSkyB, but the satellite broadcaster is riding high with a deal to share F1 broadcasting rights with the BBC, and pre-tax profits of £1bn in the year to end of June. The six-year Formula One deal will run from 2012 to 2018, and gives Sky rights to broadcast all the races, qualifying and practice sessions. The BBC will have the rights to half the races and qualifying sessions, including key ones such as the British Grand Prix, Monaco Grand Prix and the final race of the season. 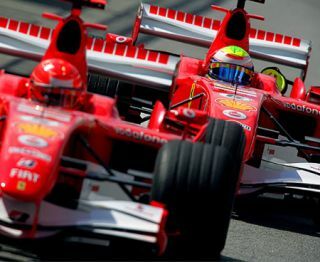 It will be the first time F1 races have not all been available on free-to-air television. Barney Francis, managing director of Sky Sports, says: "This is fantastic news for Formula One fans and Sky Sports will be the only place to follow every race live and in HD. "We will give Formula One the full Sky Sports treatment with a commitment to each race never seen before on UK television. "As well as unrivalled build up to each race on Sky Sports News, we will broadcast in-depth live coverage of every session. Sky customers with Sky Sports will also be able to enjoy F1 across multiple platforms and devices, including Sky Go." Sky has confirmed there will be no adverts during F1 races it broadcasts. It has also explained that the races will not be available on a pay-per-view basis: viewers will need a Sky Sports subscription. Formula One teams are now seeking clarification from F1 supremo Bernie Ecclestone on how the new deal will work, with some concerned about the sport moving away from free-to-air television. More on this from our sister title Autosport. The BBC, meanwhile, has hit back at early critiscism of the move, which it puts down to budgetary pressures. "While our coverage from 2012 may not be as extensive as it has been up to now, the bare facts are that the BBC needs to save money. Given the financial circumstances in which we find ourselves, we believe this new deal offers the best outcome for licence-fee payers, " writes BBC Sports Editor, Ben Gallop, in this blog.. In an unrelated move, the BBC is trialling HD online feeds of this weekend's Hungarian Grand Prix and qualifying. More info here. BSkyB certainly isn't short of cash to fund its coverage of F1. Revenues for the year to June were up 16% to £6.6bn, and the company's operating profits rose 23% to £1.07bn. It has announced a £750m share buy-back to appease investors after the failure of News Corp's bid for BSkyB.